Are all diamonds a girl’s best friend? Not by any means, and you should know why. You probably know that not all diamonds are created equal regarding cut, clarity and other features. But do you know that some diamonds come with an ethical target on their back? We’re talking about blood diamonds. These diamonds originate from sources you don’t want to support. But what is a blood diamond? Keep reading for the information you need to know. What’s the History Behind Blood Diamonds? The term “blood diamonds” comes from the fact that the diamonds were sold to pay for bloody wars that killed thousands, while also abusing adult and child workers in the mines. In the late 1990s, miners illegally sold diamonds to fund weapons used in conflicts and civil wars, particularly in western and central Africa. More specifically, warlords and rebels used profits from the trade of blood diamonds to purchase arms during brutal conflicts in Sierra Leone, Angola, and the Democratic Republic of Congo (DRC). These wars resulted in more than 3.7 million deaths. Back then, blood diamonds accounted for an estimated 4% of all diamonds on the international market. Many were educated on this subject in the frightening Leonardo DiCaprio film of the same name. 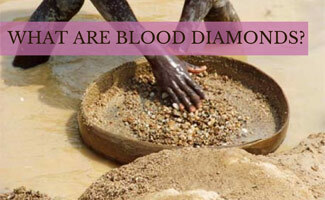 The following video chronicles the plight of those affected by blood diamonds. Are Blood Diamonds Still on the Market? The short (and unfortunate) answer is yes. Although the wars in Sierra Leone and Angola are over, blood diamonds remain in circulation. In the West African country Côte d’Ivoire, rebels involved in a brutal conflict continue to use blood diamond profits to arm their cause. Traders smuggle these diamonds out of the country, and they make it to the legal diamond market. Merchants continue to smuggle conflict diamonds out of Liberia and other countries, too. The news isn’t all bad. Today, less than 1% of the world’s diamonds are conflict-free diamonds, thanks in part to the Kimberley Process Certification System that was adopted in 2003. The Kimberley Process is a UN-mandated policy that guards against conflict diamonds entering the legitimate diamond market. The Kimberley Process, however, comes with its share of problems and loopholes, so it’s not a guaranteed barrier to the blood diamond trade market. Should I Be Concerned About Other Ethical Issues? Yes. Illegal smuggling and child labor issues are an ongoing problem in some diamond mines. Miners work under dangerous conditions; child labor is rampant, and corrupt leaders withhold funds to boost economic development in diamond mining communities. How Do I Buy a Conflict Free Diamond? Some jewelry suppliers have implemented ethical diamond practices. Unfortunately, many have not. Further, there is little information at smaller retailers about these policies. This knowledge gap makes it difficult for consumers to identify which jewelers sell conflict-free engagement rings, ethical wedding rings and other non blood diamond jewelry. Below are some guidelines to help in your search. Ask each jeweler details about where the company sources its diamonds. Diamonds mined in Canada are an excellent choice, although they may be more expensive. Canada is strict about its ethical and environmental regulations. African countries Namibia and Botswana enforce stringent labor and environmental standards and make sure diamond mining profits create local jobs and lead to positive local development. Shop around for jewelers committed to ethical and conflict-free diamonds. Some companies continue to push for more stringent regulations and support non-profit initiatives, like the Diamond Development Initiative, which help promote ethical practices. Which Jewelers Practice Ethical Standards? Be sure to see our best online engagement ring reviews for more information about some of the companies listed above. Is there a jeweler that offers ethical engagement rings that you recommend? Yikes! I hope my wedding ring isn’t a blood diamond, good to know for future purchases though!